Polishing– is the process of creating a smooth and shiny surface by rubbing it or using a chemical action, leaving a surface with a significant specular reflection. Buff polish(which can be mirror or satin finish),Barrel polish, Vibration polish, Electrical polish and so on. Sand blasting– is a general term used to describe the act of propelling very fine bits of material at high-velocity to clean or etch a surface. Sand used to be the most commonly used material, but since the lung disease silicosis is caused by extended inhalation of the dust created by sand, other materials are now used in its place. Any small, relatively uniform particles will work, such as steel grit, copper slag, walnut shells, powdered abrasives, even bits of coconut shell. Due to the dangers of inhaling dust during the process, sandblasting is carefully controlled, using an alternate air supply, protective wear, and proper ventilation. Heat treatment-is the controlled heating and cooling of metals to alter their physical and mechanical properties without changing the product shape. Heat treatment is sometimes done inadvertently due to manufacturing processes that either heat or cool the metal such as welding or forming. 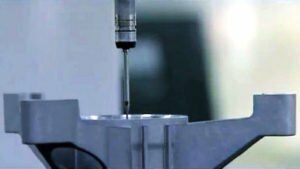 Heat Treatment is often associated with increasing the strength of material, but it can also be used to alter certain manufacturability objectives such as improve machining, improve formability, restore ductility after a cold working operation. Thus it is a very enabling manufacturing process that can not only help other manufacturing process, but can also improve product performance by increasing strength or other desirable characteristics. Please contact us for details of other finishing on metal parts.